Full text updates at www.haitiaid.org; photos on our Facebook fan page. Schools in Jacmel, Haiti are struggling to return students to school. $16 can provide tuition for a student for a MONTH (including lunches). Please consider donating to Vie de France. We have reviewed their budget, visited their facility and have faith in ther ability to deliver a proper education for 625 students. School starts soon in Jacmel Haiti - many school are struggling with how to purchase supplies and pay teachers wages. There is a substantial increase in the amount of students who have families that cannot afford to pay tuition due to earthquake losses. Accepting donations on behalf of Vie de France in Jacmel. Jacmel Chamber of Commerce is seeking endorsements for their Economic Development Plan. Please go to: www.jacmelchamber.org to download the plan and endorsement forms. They are also seeking other partners to help implement the plan. Please email need@haitiaid.org with your area of interest, organization, and level of committment. Word from Twitter that Les Cayes in underwater in flooding. Haiti Aid Network featured in Woodinville Weekly. Click here for the article. Vie de France school, with 625 students, slated to open on 3/1/2010. Desperate need for school supplies, back pack, books. Please email need@haitiaid.org to arrange a backpack drive or donate to the school. Jacmel Chamber of Commerce posts final Economic Development Plan (including some disaster stats near the end of the document). Please visit: www.jacmelchamber.org to view and endorse the plan. Seeking volunteer to help with online web form. Please contact need@haitiaid.org if interested. Thanks for all of the generous donations of items. We are actively fundraising to transport items from Miami to Jacmel, Haiti. Please reach deep - these supplies are critical and transportation options are drying up while need is increasing. Photos of distribution of supplies ferried by Liberty Schooner to Jacmel, Haiti up on facebook fan page. Jacmel Economic Development Plan (English Version) is updated to reflect the earthquake. The plan is waiting on final government statistics to be dropped in for adoption. French version will be updated after statistics are available. Need transport for a creole-fluent volunteer grief counselor from Hartsfield-Jackson airport to Jacmel, Haiti on 2/15, return 2/26. At Haiti Aid Network, we do not believe in promoting gore to gain attention. However, we do feel it is appropriate to show tasteful photos that help our donors connect to the tragedy and the people they are helping. Below are a couple of photos from a recent aid trip to Jacmel, Haiti. We are working on both short term needs and long term sustainable rebuilding. We are updating our projects and this website frequently, please check back regularly for more information. Updated needs list from the Jacmel Chamber of Commerce follows. Please note, the commercial dock is open and functional. It can take a larger vessel, but does not have a crane. Distribution of aid from Haiti Aid Network via the Liberty Schooner has been distributed. Distribution report to come soon. Donation of flight time/charter is needed to move 17 people (7 children, 7 family, 2-3 others) from Ft. Lauderdale to Philadelphia area hospitals for medical treatment. The Liberty Schooner has made it to Jamaica to refuel and resupply. Shipment of donated water purification devices being shipped from China to Miami for transport to Jacmel and distribution by Haiti Aid Network. Please check out the video here. Schools in Jacmel slated to open between March 1-8. The large dock in Jacmel has been verified by Haiti Aid Network to be functional and capable of accepting larger vessels (up to 800-1,000 ton). Haiti Aid Network is committed to working on both immediate needs and long term rebuilding. Please become a fan of Haiti Aid Network for photos of the devastation in the city of Jacmel. Liberty Schooner hit some foul weather and used more fuel than anticipated. We are seeking donations so we don't need to dip into the next run's budget. 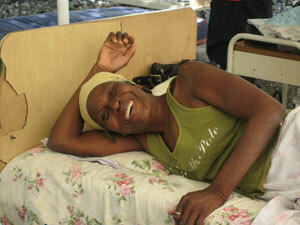 Haiti Aid Network representative returns from Jacmel. Presently in Santiago, DR. More updates to come soon. Please watch this page for text updates and facebook for photos of Jacmel <24 hours old. Need report from near Oban. Approximately 200 people with no aid since the earthquake. For physical donations in Miami: Please collect as many tents/tarps as possible. There is a huge housing shortage. Flight bound for Jacmel with medical supplies and other items scheduled to depart within 24 hours from Ft. Lauderdale. Haiti Aid Network representative will be on board to ensure appropriate distribution. Liberty Schooner expects to cover 180 miles in the first 24 hours from departure. The Liberty Schooner is carrying medical supplies, food, and other necessities bound for Jacmel, Haiti. Photo of Liberty Schooner leaving port for Jacmel, Haiti. Photos going up on Facebook. Become a fan and track progress! Liberty Schooner leaves Miami bound for Jacmel with a full cargo hold of supplies. Photos to come soon. Please forgive our delayed updates while we got the boat ready for departure. Thank you to generous donors for medical supplies, food, clothing, funds and other supplies to make this trip possible. We will be running continuous routes between Miami and Jacmel until funding is exhausted or aid can be delivered in a more efficient manner. Jacmel is requesting any volunteers fluent in French/Creole who are either psychologists or trained grief counseling. Haiti Aid Network is setting sail shortly for Jacmel. Communications may be limited. Please be patient and communicate via email as the voicemail may get full before we have the ability to respond. Haiti Aid Network board member heads to Miami to facilitate aid boat departure. Jacmel school needs a diesel generator donated to help provide for 625 students and othe community members. Haiti Aid Network has the ability to transport from Miami. Please email tiffany@haitiaid.org to donate. We are still seeking contributions to extend supply runs to the south coast of Haiti, in the Jacmel area. There is still emergent need for basics like food, clothing, medicines. However, Jacmel is also looking to the future and seeking construction supplies to begin a rebuilding effort. Please give generously to help those on the south coast rebuild their lives. We are closing in on the funds required to green light runs from Miami to Jacmel, Haiti. If you are in the Miami area and looking to donate physical goods, please contact tiffany@haitiaid.org for information on what goods are needed as well as proper package and labeling. If you are an in Jacmel, and in need of supplies, please email need@haitiaid.org with your request. We will be providing supplies as available, and prioritized based on highest need and donor request. We are continuing to fundraise for boat runs. Boats will be run as frequently as funds allow until donations can no longer fund or need is greater elsewhere. Our direction will shift to long-term rebuilding and economic development efforts once the region is stablized. Limited dock opening in Port-au-Prince excepted to help more aid reach Haiti. No additional damage reported from this morning's large aftershock. 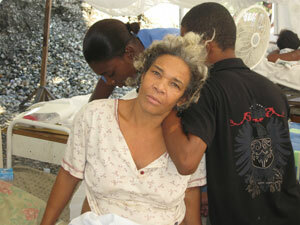 Residents in Jacmel are still shaken from the tremor. Still substantial shortages in supplies reported, particularly: medical supplies/staff, food, clothing and shelter. Aid is slowly appearing, but needs still drastically exceed supplies. A magnitude 6.0 aftershock has hit Haiti. Additional damage reports as available. We are still fundraising for aid to the Jacmel region. An orphanage in Jacmel, Haiti is seeking food, hygiene kits, clothing for 19 girls aged 2-11. We are still seeking either vessel donations or funds donations to ferry supplies for several weeks of continuous runs between Miami and Jacmel, Haiti. Physical donations will be accepted at dock after a vessel(s) is secured. For information on proper packaging to help aid on-ground distribution, please email: tiffany@haitiaid.org. We are still seeking donations for both air and boat transfer. All funds donated go directly to providing aid except for funds transfer fees (such as those charged by paypal to accept funds). Sean from Interpreters and Translators, Inc. is offering video interpreting services for medical teams. Units require an internet connection for use. Over 150 languages can be translated, including Creole. Please contact tiffany@haitiaid.org for more information. Preliminary reports that some aid may have arrived in Jacmel, Haiti. Three boats are in the harbor and appear to have soldiers and some form of aid. More information as available. In addition to boat donors, we have just been informed that the runway in Jacmel is cleared to accept aid. In progress, is an effort to raise funds for the first plane in with medical supplies and a doctor. We need approximately $3,500 more for fuel costs. We are still fundraising to cover boat costs of $15,000 to ferry aid for 6 weeks between Miami and the Jacmel dock. We are also accepting pleasure craft that wishes to run medical supplies, personnel and food. If you are interested in completing a run or are a qualified medical professional wishing to aid the people of Jacmel, please email tiffany@haitiaid.org. Please note, donations of any size are accepted. All funds go directly to aid/transport except for fees associated with collectings funds (e.g. PayPal). Everyone working on this emergency with Haiti Aid Network is volunteering their time. Report from Baba in Basin Bleu: "The big problem for everybody is food. Food is expensive." Other reports requesting food, medical supplies, and medical staff. We are still seeking donations for boat sponsorship. Some reports are arriving that minimal aid has arrived in Jacmel from Marines. More aid is urgently needed. Jacmel Chamber of Commerce adds to plea for aid. First aid supplies, food, water, clothing and medical personnel urgently needed. In the words of Rolan Zenny, Jacmel is a "catastrophe." Haiti Aid Network is still fundraising for a vessel to bring aid directly into the harbor in Jacmel. More information received on the capacity of the port in Jacmel. The commercial dock should be able to accomodate vessels up to 700-1,000 tons. However, the port is moderately shallow (no details available at present time). There is also a smaller dock that can accomodate smaller commercial and non-commercial boats. Please contact tiffany@haitiaid.org to coordinate either donating boat use or if you have a supply boat unable to dock would like to bring into port to provide aid to residents of Jacmel. We are still seeking funding to cover the cost of Liberty Schooner. We have an opportunity to combine forces with a vessel at their cost. Because this is a primarily wind-powered ship, there are minimal fuel costs and continuous runs between Miami, FL and Jacmel from funding until February 28th can be done for $15,000. The boat has a capacity for 10,000-15,000 pounds of cargo and can sleep several people for transport of medical and distribution volunteers. Thank you to Liberty Schooner for the generous offer (www.libertyschooner.com). Let's see if we can make this happen! If we can raise the funds we will accept physical donations at the dock on departure days. Email tiffany@haitiaid.org with questions or if you need directions on appropriate labelling and packaging, as well as most needed items. We are still looking for additional pro bono boat sponsors. Video coverage has been posted online from Jacmel on the Cine Institute website. Also posted, a request for "an orthopedist, two anesteniologists and a surgeon" on the Cine Institute site. We are actively recruiting any size vessel to make a pro bono run or runs from any port in the US to the port in Jacmel. Please email tiffany@haitiaid.org so that we can coordinate donations to the port. We also need to know how many guests can be carried to try to coordinate medical and distribution volunteers. Residents of and organizations in the Jacmel area may email requests to: need@haitiaid.org. We will do our best to match aid needs to donations. There is an open dock in Jacmel that can accept aid. Please email tiffany@haitiaid.org to coordinate ships into port. We have contact on-ground every few hours via email to facilitate aid acceptance. Currently, we are unaware of any functional phone service to the area. We are still seeking boat sponsor(s). Given the urgency of need, both commercial and non-commercial vessels that can transport medicine, water, food, and clothing will be accomodated. There are two docks in this port; one can accept larger commercial vessels, the other can accomodate non-commercial vessels. Please report which city the vessel can sail out of so that we can coordinate as many supplies as possible to the location. There has been no reported aid to this area amid reports of massive destruction and need. We have word that the Jacmel appears to be capable of accepting at least one aid boat. This is a visual inspection as no qualified structural engineers are available. We are working on a boat and are still looking for a boat sponsor. Other organizations with aid boats unable to dock in PAP with the desire to help the Jacmel community, please email: tiffany@haitiaid.org to coordinate ground efforts. Approximately 100,000 people in the area are completely cut off from efforts in PAP and have no reported aid. High loss of life expected. Food, water, and medical supplies urgently needed. First ground report from Jacmel: 35-40% of structures in the downtown area have collapsed. Both the airport and a local school yard (building may have sustained damage) are serving as shelter areas. Too many deaths for an accurate count, no estimates available. Supplies needed most urgently are: medicines/items for wound care, bulk food with low packaging, and clothing. We are currently seeking a boat sponsor from either Galveston, TX or Miami, FL that has the capacity to lift a 15,000 pound water generator, diesel fuel and other supplies. If/when secured, we will accept physical donations at a dock location. There is currently no air traffic permitted into PAP airport. Both the port and runway are being assessed in Jacmel for aid to the southern region. A request has been put in to Jacmel to begin mobilizing horses to transport supplies where vehicles cannot travel until roads are cleared/passable and air support is available. We are beginning to receive preliminary aid reports. We are waiting for word on the dock in Jacmel in the Sud'est to see if it is possible to take in an aid boat. The city itself seems to have major destruction and does not have easy access to aid work being complete in Port-au-Prince. Jacmel is a larger city with historic significance and a substantial population. We are currently seeking a boat sponsor. If we can secure a boat and passage we will do our best to accept physical donations. Until that point, we are channeling funds. Please email tiffany@haitiaid.org directly with large or non-traditional donations. For monetary donations please use the donate now button and donate through paypal. A high magnitude earthquake has hit Haiti, with the epicenter approximately 10 miles from Port-au-Prince and several miles to the west of Jacmel. Many are dead and missing. Hundreds have lost homes and businesses to construction not build to withstand high-intensity earthquakes. Please donate by clicking the "donate now" button in the upper right hand corner. Donations received that are not specified for another area will be directed towards earthquake recovery. We will provide updates on the Jacmel area as soon as they are available. Requests for aid should be sent to need@haitiaid.org. Please be aware that the recent earthquake caught us mid-way through a website update. The "high season" for emergent need in Haiti usually corresponds to the hurricane season in the Caribbean (August through November). Some links and navigational tools may not work in all browsers. The majority of our resources are focused on emergency response and we will return to web overhaul after we have completed an assessment and action plan for the current disaster. Please check back for information. Throughout Haiti there are hundreds of not for profit organizations doing what they can to improve the lot of those around them. They struggle with lack of funding. Many do not have the resources to pull together a comprehensive plan. Perhaps there is a better way? Haiti Aid Network provides a vehicle to enable smaller not for profit entities. With a wide menu of services, we are dedicated to matching good deeds to worthy needs. Upon arrival of our 501 (c) 3 status we will begin receiving tax-deductible donations that can be specified as: education, healthcare, hunger, children, elderly, environment, or general aid. Specific charity Haiti Aid Network Affiliates can also be designated as a recipient. All of our Affiliates are rigorously screened for requirements on percentage of administration to aid, efficiency of site operations, as well as many other minimum service standards. We schedule on-site visits in Haiti to ensure that your dollars go to help and are not easily wasted. Not an Affiliate of the Haiti Aid Network? Join now! We can provide a comprehensive range of services from aid in marketing strategy through fundraising assistance. For a full menu of our aid programs, visit our Services page. Together we can change the fate of a nation. Many missing or homeless after an earthquake hits Haiti. Haiti Aid Network now accepting donations for victims in the Jacmel region. Liberty Schooner runs between Miami and Jacmel.